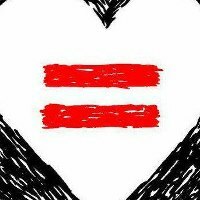 Today, I changed my Twitter avatar to a heart with an equals sign. It’s a symbol of solidarity in the fight for marriage equality in this country. If you’ve been living under a rock, today is when the Supreme Court heard arguments about California’s divisive Prop 8. Tomorrow they’ll hear arguments about the harmful DOMA. We really are at a crossroads in history. It sounds like hyperbole but I firmly believe it. I’ll tell you: it’s about speaking out. More importantly, it’s about empathy. If you want to know how a simple gesture like changing your avatar for a cause you truly believe in can help, ask someone like Tyler Oakley. Ask Dan Savage. Ask Rachel Maddow. Ask any number of people who live out and proud about being inundated with e-mails and letters, saying what an inspiration they are. Saying how that person gave them hope when their parents threw them out of the house for being gay. Saying how they came to terms with their own sexuality once they saw that it WAS possible to be out and happy (something many closeted individuals don’t believe). LGBT rights have been in the news a lot lately and, in all the hullaballoo, it’s easy to think: “See? There’s lots of attention. Everyone is getting the message.” But they’re not. If they were, we wouldn’t need the Trevor Project. Changing your avatar is like donning your Packers jersey on the day of the big game. It’s not going to change the outcome of the game but it certainly engenders a spirit of community and belonging. I’m curious if the people questioning the avatar change also look down their nose at wearing purple on Spirit Day. Or wearing pink ribbons in October. Do these help anything? I guess that depends on your definition of help. But if you say “no,” you have a very limited definition. Statistics show that it’s harder for the conservative elements of this country to condemn us if they know us. If they have a personal connection. (Witness Senator Portman.) As much as I’d like to say that every closeted person MUST come out, I know that, for some people, it’s just not safe. And I want everyone to be safe. But I also believe that if you CAN come out safely, you should. We need to be heard. Especially for those people who aren’t safe enough to speak. It can save lives. I promise you. Patrick Stewart didn’t change his avatar. But he spoke out. And he didn’t question anyone who did the same. It would be easy for Mr. Stewart—a white, straight male—to stand from a place of privilege and stay silent. But even if he’s never been the target of persecution (and, who knows, maybe he was), he can at least empathize with those who are. You support marriage equality and don’t want to change your avatar? Fine. That’s your right. I appreciate your support and ask nothing more from you. But you’ve got a lot of gall if you derisively question the possible impact or try to call out those people who are taking a stance, even with a simple gesture.